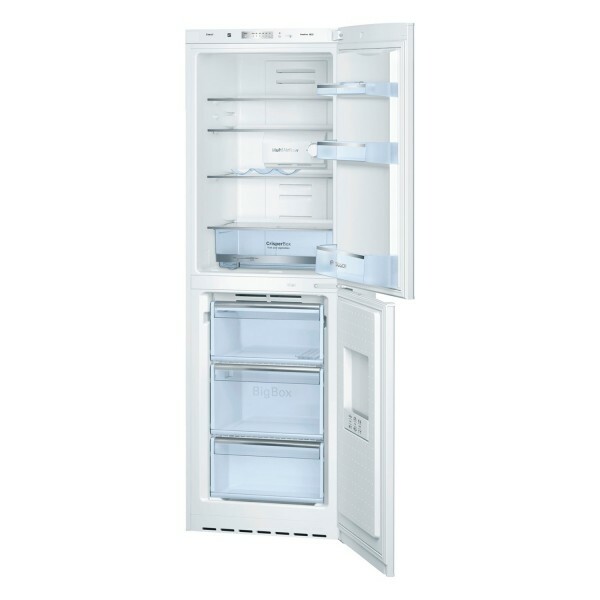 Product information "Bosch KGN34VW24G frost Free Fridge Freezer"
This Bosch fridge freezer is bursting with useful features. The KGN34VW24G is from Europe’s number one cooling manufacturer, and it doesn’t disappoint. The KGN34VW24G has two separate cooling circuits, which lets the food in your fridge remain at optimum temperature while your frozen goods stay ice cold. By eliminating the risk of transferring humidity between the two compartments, this fridge freezer delivers an excellent performance at all times. This model is frost free, so you’ll never have to worry about the tedious task of defrosting. Temperature in the upper fridge section is regulated withAuto Defrost technology, while the frost free freezer stops excess ice from gathering in the lower compartment. FreshSense sensors constantly measure the ambient temperature and the temperature of the fridge and freezer. This keeps the compartments at a constant temperature - keeping your food fresher for longer. Another highlight is the antibacterial AirFresh filter, which reduces the smell of food odours. This means powerful aromas from strong cheeses, or even gone-off items, won’t affect the taste of other foods - something every fridge needs from time to time. The multi-air flow system, designed to improve air circulation within the fridge, helps your food remain fresh for longer. The salad crisper box is the perfect place for your fruit and vegetables, and for everything else there are three pull out glass shelves. A LED light makes finding your food easy - perfect for when you come down for that midnight snack. There’s plenty of room in the three spacious freezer drawers for all your frozen goods. The four star performance means the KGN34VW24G can store items for up to 12 months. In the case of a power outage, frozen food will keep for 14 hours without a mains connection. The KGN34VW24G has a sleek and clean design, featuring an exclusive integrated horizontal handle. It’s been awarded an A+ energy efficiency rating, which is really useful considering it runs 24 hours a day. Related links to "Bosch KGN34VW24G frost Free Fridge Freezer"
Customer review for "Bosch KGN34VW24G frost Free Fridge Freezer"